The East Troy High School volleyball team honored their six seniors Oct. 3 who played their last home conference match of their outstanding careers. East Troy played host to the Whippets of Whitewater and head coach Jeremy Weis allowed his senior talent to be showcased early in the match. The Trojans sent a lineup of all seniors, Alyssa Scuric, Mykie Olsen, Brittney Jakscht, Myranda Dallas, Bryzena Santos, and Kelsey Kiesow, into the match for game one. The experienced Trojan talent took little time taking the lead against the Whippets and jumped to a quick 6-1 lead. A midgame timeout by Whitewater did not phase the senior girls as the Trojans continued to dominate. Bryzena Santos, a middle hitter that usually sees little time as a server would go on a long service streak to finish the first game up 25-12. With the Trojans back to their normal lineup, East Troy would once again take an early 8-1 lead. The overmatched Whippets could do little to challenge the Black and Gold as East Troy took the second set easily 25-12. East Troy would complete the three game sweep of Whitewater 25-13. Whitewater scored the first point of the set, taking their only led of the night before East Troy came storming back. Weis said that Senior Night was very special for his six seniors. “I was thinking back to when this group all started playing club ball and where they are today,” Weis said. Weis also commented about how dominant this group of players has been. Over their four years of high school, these seniors have yet to lose a regular season conference match and they have only lost one match in the year-end conference tournament. “That is something to be very proud of,” said Weis. Kelsey Kiesow lead all players with 11 kills as Brittney Jakscht added 29 assists. Bryzena Santos notched seven digs as she teamed up with Mykie Olsen who each added two blocks. Santos and Olsen once again teamed up this time with Chloe Jakscht who had two aces for the Trojans. Earlier in the week East Troy hosted Evansville and made quick work of the visiting Blue Devils. The Trojans used their aggressive serving to cause all kinds of issues for Evansville. 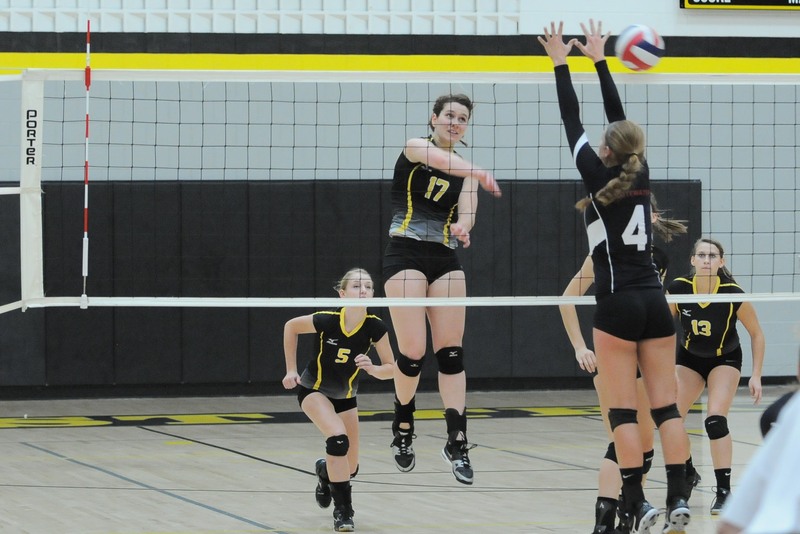 The Black and Gold dominated 25-7, 25-10, and 25-9 for the expected sweep. Alyssa Scuric led with nine kills as Brittney Jakscht added 30 assists and six aces. Mykie Olsen dug up a team high 12 balls while Kelsey Kiesow rounded out the leaders with two blocks. The wins moved East Troy overall record to 33-0 and 8-0 in conference. The Trojans begin their final week of Rock Valley Conference play as they travel to Jefferson on Tuesday and Edgerton on Thursday.